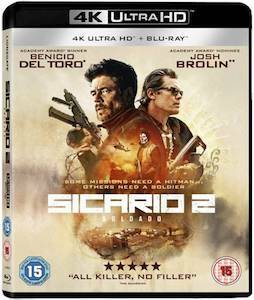 The War on Drugs meets the War on Terror in this sequel to Sicario, Denis Villeneuve’s sensational 2015 thriller. One of the most daring and powerful movies ever made about America’s so-called war on drugs, Sicario was blessed with an astonishing array of talent. Aside from Villeneuve at the helm, there was Roger Deakins sublime cinematography, a powerhouse central performance from Emily Blunt, and a heart-pounding score from the late Jóhann Jóhannsson. With Villeneuve and Deakins off playing with androids in 2049, and Blunt’s FBI agent Kate Macer made surplus to requirements, a lot of the components that made Sicario so special are missing in Soldado. But we’re still left with an embarrassment of riches, in the shape of original screenwriter Taylor Sheridan, and both Benicio del Toro and Josh Brolin (capping off a magnificent 2018) reprising their roles from the first film. Italian director Stefano Sollima, best known for his television work on Romanzo Criminale and Gomorrah has stepped in to helm. So does it live up to the first? Well it starts off in sensational style. The first act of Sicario 2: Soldado is an absolutely breathless overture. The Mexican drug cartels have taken control of people smuggling at the US border. Terrorist organisations such as ISIS are now paying the cartels vast sums of money to smuggle suicide bombers and terror cells into America across the porous border, hidden alongside migrant workers and families fleeing poverty and persecution. This ripped from the headlines premise taps into the right-leaning fear of mass immigration. A stunningly staged terror attack in Kansas City sets the film off in shocking style. This act effectively puts the cartels into the same classification as terrorists, thus enabling the US Government to take their war on the cartels to a whole new level. The Secretary of Defense (Matthew Modine) enlists CIA agent Matt Graver (Josh Brolin) to apply the same extreme tactics he has been using in Syria against the cartels. His plan is to start a war between the cartels and let them destroy each other. To accomplish this he is going to kidnap the daughter of a cartel boss. He also reaches out to his old sicario pal Alejandro (Benicio del Toro) for when things get messy. And boy do they get messy. So far so good. The film is relentlessly paced in the first hour, and the action is terrifically staged, very violent and realistic. But it’s when Sollima takes his foot off the gas that things start to unravel. Sicario 2: Soldado is dealing with the same knotty, geo-political mess that the first film did, but without any of the ambiguity and confusing, moral murkiness that made Sicario such a compelling film. Things here are much more black and white. This makes the film a much more linear, and conventional thriller. But once the pace lessens and you’ve got some time to ponder on what is actually happening, some of the plot developments will leave you scratching your head. Graver and Alejandro were cyphers in the first film. Fascinating characters, but they existed as representations of a world we couldn’t possibly understand. The land of wolves. We (the audience) were Kate Macer in that film – perpetually kept at a distance. In Soldado, Graver and Alejandro are the main characters and we are supposed to go on some sort of emotional journey with them, but it just doesn’t ring true. Brolin and del Toro are both fantastic as these alpha predators, but they are let down by Sheridan’s script which promises far more than it delivers. Taken on its own merit, Sicario 2: Soldado is a film that is very easy to recommend. A slick and intelligent action thriller, politically relevant, with stunning cinematography from Dariusz Wolski, and commanding central performances. It’s a solid film. However – as I’m sure is clear from what you’ve already read – I can’t not hold it up against the original. And it’s just not quite as good in every aspect. That doesn’t mean it’s bad in anyway whatsoever. It’s just not as good. The blu-ray release comes with three short featurettes. One looks at the characters of Matt and Alejandro, and how they have evolved from the first film. One is a brief making-of documentary, and the other is a look at how the sequel was developed from a standalone film to a potential franchise.